Camp de Loisirs du Lac is set in a beautiful, green shady estate of 9 hectares. There are pitches of up to a spacious 300 m2 which are suitable for caravans, motorhomes and tents. There is a nearby supermarket within 2kms and local shops are less than 100 metres from the site. They also provide winter parking for caravans. 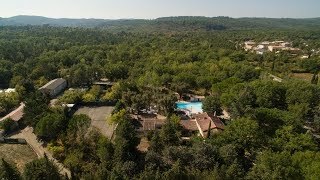 Loisirs du Lac is also near to some of the most beautiful villages in France including Montauroux, Callian, Mons, Fayence, Tanneron, Tourrettes, Grasse and Seillans. You can find perfumeries and The Riviera in close proximity as well. There is a delightful walk to Lake Saint Cassien from the site, and the beaches of Cannes and Frejus are approximately 20 minutes’ drive away. Disabled Facilities (excl. pool). Warm showers and WC's. Laundry. Restaurant. Snack bar and takeaway. Swimming pool. Children's splash pool. Table tennis. Tennis. Pétanque. Children's playground. WiFi. Dancing on Saturday evenings in high season.